Zack has dramatically improved his technique this offseason. Mike has the potential to be something special and will be a 3 year varsity starter. Roman has all the tools to be special. 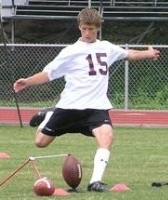 2006 Head to Head Kicking Competition Runner up. Varsity Starter as Sophomore and Junior. Justin has already had a great career and is extremely polished. 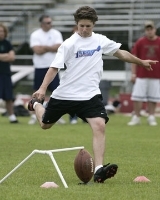 Zack is developing into a very reliable placekicker. 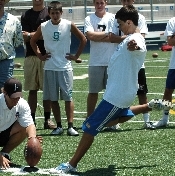 Mike is currently the best kicker in his age group in the nation. Robert has tremendous leg strength for a kicker his age. Andrew is a tremendous athlete with great leg speed and consistency. 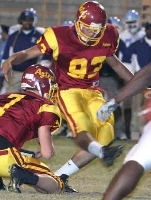 Aria will be a four year starter at Esperanza and has tremendous leg strength. Chase gets the ball up very quickly and has the leg strength to be one of the best. Tremendous Combo Punter/Kicker. 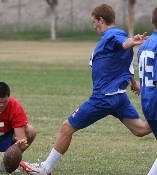 Connor has tremendous abilty and is extremely powerful for a young kicker.